A state belongs to all its citizens. It has been regarded to be a product of human action. It operates through the loyalty of the people; so it has some obligations for its citizens. A state belongs to all the people so it has to create such a conducive environment where every kind of citizen rights is secure and they can freely exercise their opportunities. People feel justice when they get equal access to power, resource and opportunity created by the state. Societies have been found to be fragmented over religion, gender, ethnicity, race, colour and culture since long. This is why no one can find a state where justice has been fully realised by each and every people. In order to overcome the situation, the notion of inclusiveness has been introduced. The Quota System as an affirmative action is one of the tools of inclusive policy which is mainly focused on increasing participation through employment of marginalised people in government and related services as well as in education system of the country. Beside this, developing their competitive capacity is another intention. The prevailing Quota System in the civil service of Bangladesh was introduced by an executive order immediately after independence in 1972 as an affirmative action to promote inclusive representations for the people of various backgrounds. The founding father of Bangladesh Sheikh Mujibur Rahman first introduced the quota system in the war-torn country to give more opportunities to the valiant Freedom Fighters, as well as women and people from small districts. The ministry of cabinet affairs issued an interim recruitment policy in which 20 per cent of civil service positions were to be filled up by merit, 30 per cent by Freedom Fighters (or their descendants), while 10 per cent were allocated for war-affected women and 40 per cent for district quotas. The system was amended four times. Currently, 30 per cent of civil service jobs are allocated to the children and grandchildren of Freedom Fighters, while 10 per cent go to women, 10 per cent to people in districts that lag others, 5 per cent to members of indigenous communities, and 1 per cent go to the physically challenged-leaving only 44 per cent to win a place on merit. There is no doubt that the existing percentage is higher. It should be reformed. The country achieved independence to build a fairly social system removing all discriminations. It can be accepted that one region will move forward and another will fall behind. But the Quota System must prevail. Question may be raised what percentage would be for it. There must be a quota system but the matter of discussion is what would be its percentage. With a five-point demand, the joint students’ platform has been demonstrating to reform the Quota System since mid-February near Dhaka University and the Shahbagh area which in 2013 was in the limelight for protests against the verdict of the Bangladesh’s War Crime Tribunal. In the face of nation-wide protests by thousands of students, Prime Minister Sheikh Hasina announced abolishment of the decades-old Quota System for recruiting government officials through an annual civil service exam. In Dhaka, mobs of students blockaded major roads, bringing traffic to a standstill. The students in the south-eastern port city of Chattogram blocked a railway track while they also caused disruptions in the major cities of Khulna, Barishal, Kushtia, Cumilla and Mymensingh demanding quota reform. Agitated demonstrators who were staging movement demanding reforms of the existing quota system in government recruitment tests set residence of Dhaka University Vice Chancellor afire on 8th April. The demonstrators vandalised each and every rooms of the Vice Chancellor and set fire both front and back sides of the residence. The agitated protestors also torched three vehicles which were kept backside of the residence. It is now clear that someone tried to use the movement against quota to create unrest before the next general election. The movement to reform the existing quota system in government jobs was indeed a conspiracy that a certain group with vested interests has hatched against the government. Anti-government forces, especially the Jamaat-e-Islami and its student wing Islami Chhatra Shibir, as well as BNP’s student wing Jatiyatabadi Chhatra Dal, were behind the movement, using the general students for their political motives. The attack on the residence of Dhaka University Vice-Chancellor was also a part of this conspiracy. The quota reform demonstrations can't be associated with the attack on residence of the Vice Chancellor. BNP acting chairperson Tarique Rahman asked a teacher of Dhaka University to organise students for mounting up ‘quota reform’ movement. Tarique Rahman, who is now staying in London and operating the leadership of the BNP, called Professor Mamun Ahmed, a teacher of BNP-Jamaat backed ‘white’ panel, asking him to organise and support students to mount the movement. In their 2.40-minute conversation on 10th April evening, Tarique Rahman asked Professor Mamun to talk with the BNP-Jamaat minded teachers and students about the movement. BNP chairperson’s adviser council member and president of Jatiyatabadi Samajik Sangskritik Sangstha (JASAS), former general secretary of Dhaka University Teachers Association Professor Mamun Ahmed, gave the responsibility to coordinate the matter over the telephone. Tarique Rahman also asked Professor Mamun to provide update information on the next day. 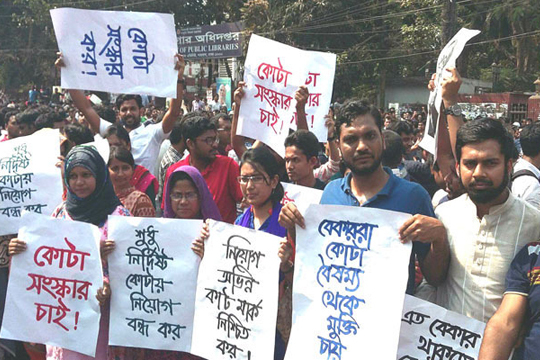 The four days of movement in different educational institutions, including Dhaka University, were agog with rumours of the darkest kind, drawing the students of residential halls to take to the streets and flaring up the anti-government sentiments. All such sensitive rumours were emanated at the dead of the night mostly when the students went back to their halls while the most spectacular one hit the very first day: AB Siddiq, a Dhaka University student demonstrating for quota reform was shot by police and then succumbed to his injuries. Soon after the announcement was made, this fake story went like wild fire, fuelled a sense of disgust among the dormitory students. On impact, female students broke the gates of the dormitories and came out to the streets while in male dormitories, residents in their hundreds streamed in too, chanting slogans in demand of punishment for the ‘killing of the student’. Moments later, it was unearthed that AB Siddiq is alive and he sustained minor injuries while participating in the protest. From his Facebook account, he posted that he could not communicate with others as his cell phone was shut as its battery exhausted. Siddiq also mentioned that he sustained some minor injuries in his forehead. It was later learnt from the mass media that for spreading those fake stories, Facebook pages including ‘Zakir's BCS specials’, ‘Troll DU’ and ‘Quota Songskar Chai’ were used. On the other hand, among the pages and news portals that already earned the notoriety for being run by Shibir activists like ‘Basherkella’ has also been found to be very much active and at the forefront to instigate the general students. Another rumour spread that Bangladesh Chhatra League (BCL) DU hall unit leaders are assaulting the general students for taking part in the movement. Those pages put another post ‘The Sufia Kamal Hall BCL unit President has cut tendons of a resident of that hall for her involvement in this quota movement’. Student movements have played crucial roles in Bangladesh’s history of politics. From the Language Movement of 1952 to the establishment of Parliamentary Democracy in 1991, and 2007 students have been the vanguards in protecting the freedom and upholding the democratic aspirations of people of Bangladesh. But the recent quota reform movements have left a question – is this movement only for quota reform? Most probably, it is a plan of BNP-Jamaat men to carry out subversive activities in the name of movement against the existing quota system. The next general election is scheduled to be held by the end of the year. Four years ago, Bangladesh experienced a massive violence ahead of the elections. Parliamentary elections in January 2014 were the most violent in the country's history. Months of political violence before and after the elections left hundreds dead and injured across the country. The BNP’s violent boycott then has proved to be a political mistake. The BNP should not repeat the mistake.